This letter from U.S. Secretary of War Edwin M. Stanton to General James H. Lane of Kansas, addresses Kansas Governor Charles Robinson's decision to select the officers of Kansas volunteer regiments himself rather than let the men of the regiments decide. 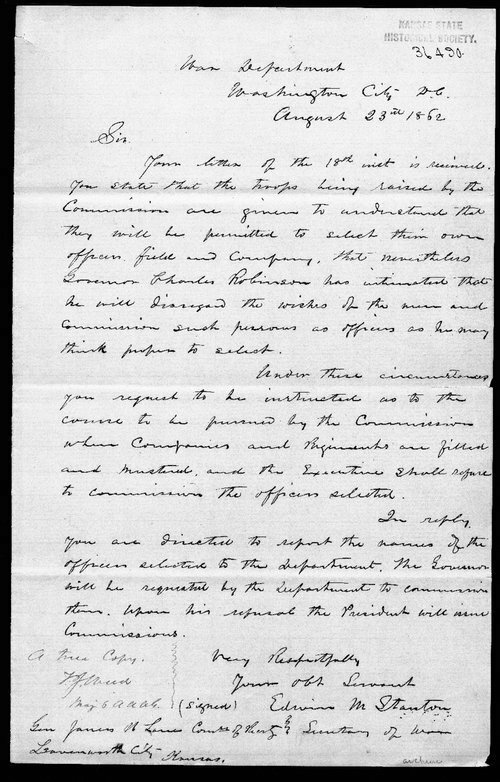 Challenging Robinson's actions, Stanton informs Lane that, if Governor Robinson refuses to abide by the wishes of the men of the regiments, President Lincoln will issue commissions to the officers they selected. Stanton's letter to Lane can be used to help students understand how officers were selected at the outset of the Civil War. In addition, the letter can also be used when discussing the interaction between state and federal government during the period.